While many Christmas decorations are used throughout the holiday season, nonecompete with the total transformation that tinsel offers. The addition of tinsel is oneof the simplest yet most effective ways to completely change a stagnant display intoa dazzling array of colour and wonder. During the holiday season, tinsel is especiallysought after, specifically high-quality extra thick tinsel that creates a lavish and splendiddisplay. 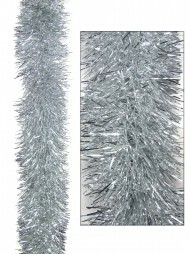 Our super deluxe tinsel is easily and immediately recognised by Christmas consumersas being of superior quality. It is perfect for adorning your Christmas tree at home, or forcreating garlands. It is also ideal for use in the office, in clubs, retails shops and in high-end department store displays. Available in a range of attractive Christmas colours that are sure to accent your existingChristmas decorations, be sure to stock up on this tinsel before the holidays are in fullswing. You will want to reuse these tinsel garlands time and again when creating lovelyshowcases that can last all season long. 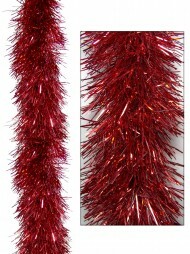 Super deluxe tinsel is one of the best Christmas decorations for your home or businessseasonal displays. The extra thick quality of these tinsel garlands cannot be beaten.The long length of 5.5 metres, with the added thickness of 150 mm by 6 ply make for atremendous visual impact. The assortment of colours, from traditional red and green tosilver, gold and blue, allows for flexible and stylish displays that are sure to dazzle andimpress all who see them.